Class Pack of 36 — An economical classroom pack of 36, 8-color sets. 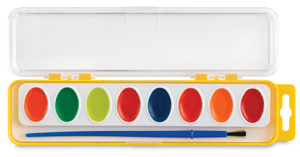 Each plastic case includes: Yellow, Orange, Violet, Red, Green, Blue, Black, and Brown, plus a soft bristle brush. 8 Pan Set — A set which consists of eight oval half-pans in Yellow, Orange, Red, Violet, Blue, Green, Brown, and Black and includes a brush. Fluorescent 8 Pan Set — Add zing, wow, and pop to artwork with this set of eight fluorescent colors in oval half-pans. Colors include Yellow, Orange, Red Orange, Red, Pink, Blue, Green, and Chartreuse. A synthetic bristle brush is also included. Refill Strips — Sargent refill strips fit in original boxes or may be easily trimmed with scissors to fit into Crayola boxes. Strips are available in packages of twelve. 16 Pan Set — This larger set consists of sixteen oval half-pans and includes the same colors that are found in the 8-Color Set plus Blue-Green, Blue-Violet, Red-Orange, Yellow-Orange, Yellow-Green, Light Blue, Pink, and White. Brush included.